I always seem to have lots of recipe ideas for rhubarb, but with their season so short, I rarely get the chance to try them out. So I was delighted when I found rhubarb in the supermarket last week – I just had to buy it! But with so many ideas, what recipe should I try? Rhubarb Mille Feuille? Rhubarb Trifle? Rhubarb & Ginger Cheesecake? Tea & Rhubarb Compote? Hmm… nope, after a walk through Greenwich Park, it had to be my Rhubarb & Orange Custard Tart idea. And, it tastes so good, that I just had to share it with you all. It is lovely with a cup of tea, or if you wanted to serve it for a dessert, I could imagine this with a Yoghurt Ice Cream. Make the sweet pastry as shown here, but add the orange peel at the same time as adding the flour. Put the milk and vanilla pod in a pan, and heat it up to just before boiling point. Mix the sugar, cornflour and eggs together in a bowl (if you are using vanilla essence rather than a vanilla pod, add the essence at this point). Pour the milk onto the egg mixture, whisking all the time. Return to the pan, and cook at a medium heat, whisking all the time, until thick. Place in a bowl, cover with cling film and place in the fridge to cool. Cut the Rhubarb so that they are all the same size, and wash. Add to a casserole, with the sugar, orange juice, and peel. Cover with tin foil, and place in a pre-heated oven at 180 Celsius. And cook for about 30 minutes, you want the rhubarb to be cooked through, but still retain its shape, you do not want the rhubarb to go to mush. Once cooked, put in fridge to cool down. Place the juice into a pan, and bring to the boil, and reduce by half. Add the agar-agar, and continue to simmer until the agar-agar has dissolved. Ensure the tart, the rhubarb, and the custard are all cooled. Place the custard into the tart case, and assemble the rhubarb ontop. Make the glaze, and cover the rhubarb with it. Place it back in the fridge to cool and set, before serving. This sounds and looks excellent, a lovely way to use rhubarb instead of the usual crumbles or pies. Thanks! I do love a rhubarb crumble though! What do you make with rhubarb? wow – I’ve just read another savoury rhubarb recipe. This sounds really interesting. 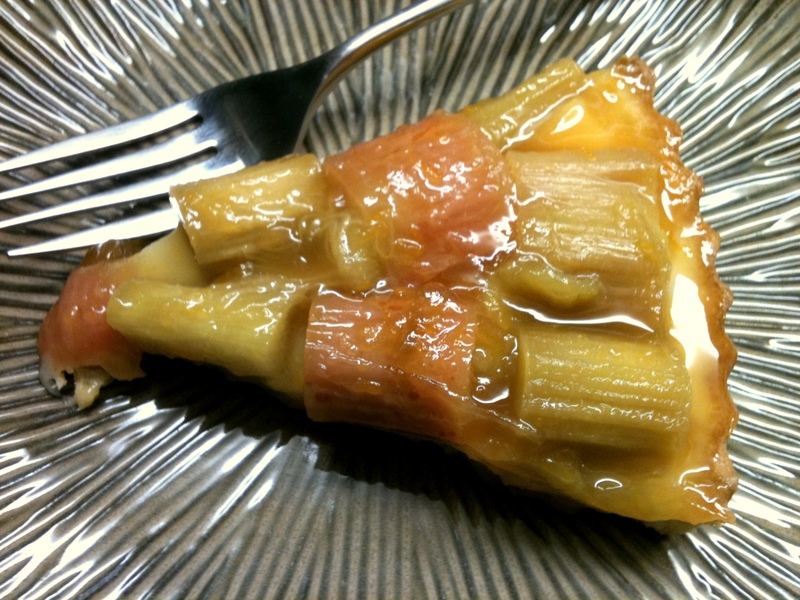 I’ve never tried to use rhubarb in a savoury dish…. I need to go buy some more rhubarb I think! This looks gorgeous, think I’ll give it a go. I have made chutney with rhubarb which was pretty good – need to dig out that recipe again too!